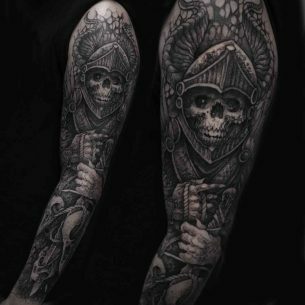 – this is a drawing occupying the whole area of the arm, forearm and a shoulder. Actually, that’s not a quite right notion, not in all cases, but in general so it is. 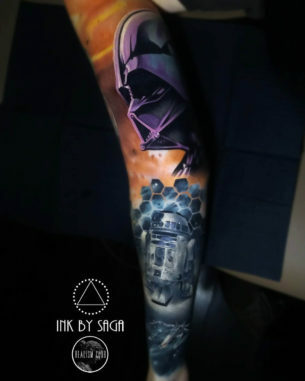 The most popular tattoo ideas for a sleeve, both for men and women, are 3D-s, which underline individual character traits of its owner and make a person unique. Here we’ll cover all the details. 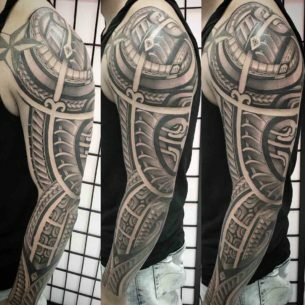 – Quarter sleeve – half of a shoulder or half of a forearm. So, the choice of size is completely personal. 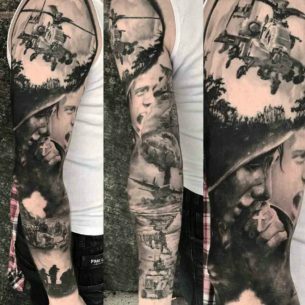 There are any straight rules either for the size on it nor for a placement. 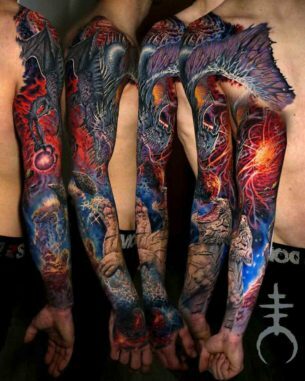 However, there are some vivid trends. 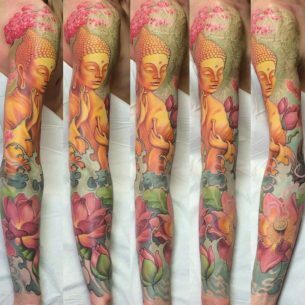 Experience suggests, that girls generally pick half sleeves and full tattoo sleeve are for men. But again, there are no rules, all choices are personal. 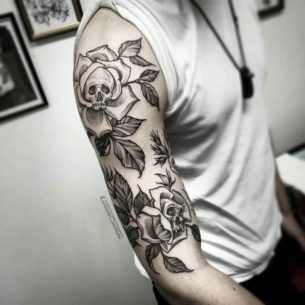 One more interesting observation: often tattoo sleeves consist of an absolutely different drawings and even in different styles. The reason it happens hides in the past. 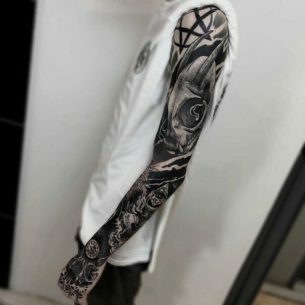 Some people eager to make a tattoo sleeve are already inked with different tattoos and they became united in one tattoo idea. 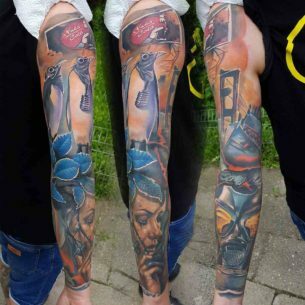 Of course, it’s better to create one complete tattoo idea for the whole sleeve – one drawing, motive, mood result as an awesome art piece altogether. 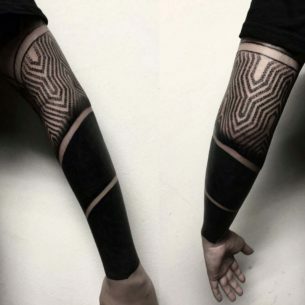 That could be biomechanical, space, historical tattoos and so on. 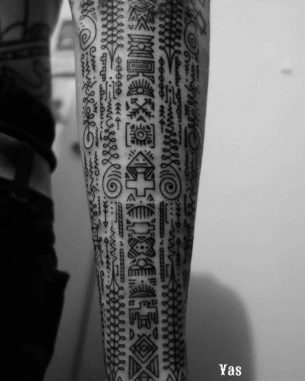 There are also blackwork tattoo sleeves, which deserve some extra attention – a part of the hand completely drawn black. 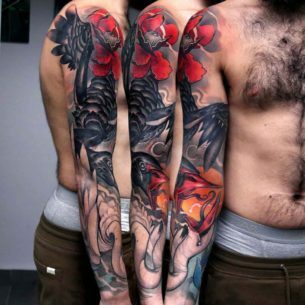 These are the choice of those, who want to have some tattoos covered up due to the blackwork technique. 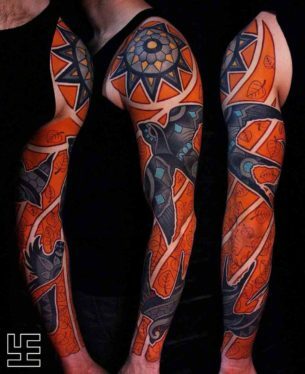 Such practice results in an incredibly awesome tattoo sleeves. There is an opinion, that men have a tendency to experiments, testing themselves and their bodies with a new styles. 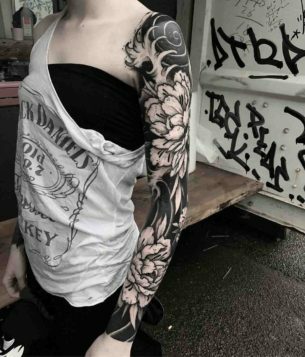 Girls vice-versa choose the most conservative and traditional tattoo ideas not to make anything for their body to look ugly. 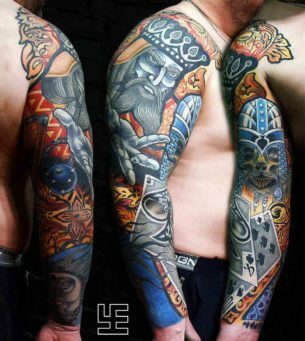 That’s why mainly the tattoo sleeves for men are fresh and astonishing. 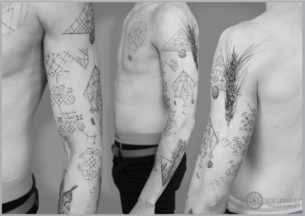 By the way, interesting fact that nowadays there is a very curious thing you can find on the internet – disposable tattoo sleeves. 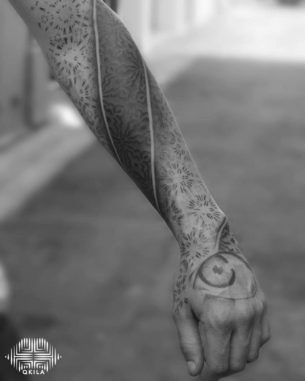 That is some kind of a clothing sleeve like tights for hands. These are popular for holidays as a part of costumes.